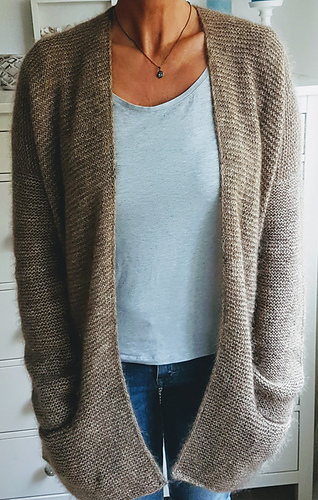 The “Girlfriends cardigan Anke” is available as a single pattern and as part of our Girlfriendscardigan ebook - The license to knit! The ebook includes 3 interpretations of the same cardi. It is all about sharing a fun knitting experience with a friend AND helping people who are in a need. 100% profit of the ebook go directly to a Berlin school Schule am Zwickauer Damm that provides food and other services to refugees. So if you feel like you want to contribute, this is a wonderful way. The Girlfriendscardigan Anke is a fun and simple project, that you can knit while chatting with your besties and have fun. It has a nice finishing touch on the edges and faux seams at the sides and the sleeves. The sweater is worked seamlessly from the top-down. Start working the back and shape it with short rows. Continue to work the back in garter sts until the length of the armhole. Then pick up the stitches for the front and work both fronts alike until the length of the armhole. Join the fronts and back to work the body in garter sts and short row front shaping down to the bottom ribbing (or optional pockets). Pick up the sleeves sts to work the sleeves in rounds. 21 sts x 34 rs/rds = 10 x 10 cm / 4 x 4 in garter st on main needle. Shown in Isager Tvinni Tweed (A) (100% wool), 510m (558yds)/100g held together with Filace Kidseta (B) (70% Mohair, 30% silk) 211m (231yds)/25g. Color (A): 10. Color (B): Grigio Melange. Or m/yds: 1160/1270 (1270/1390, 1380/1510, 1490/1630, 1600/1750, 1720/1880) of a similar Yarn A. Or m/yds: 1140/1260 (1250/1370, 1360/1490, 1470/1600, 1580/1730, 1700/1860) of a similar Yarn B.